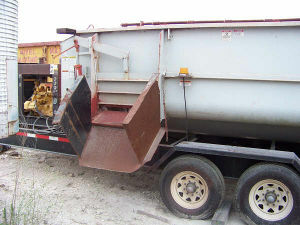 This is a 7 yrd.batch-coloring unit by Fecon, powered by a John Deere Diesel engine, has a 5-yard hopper that feeds the product into the coloring chamber. Unit is portable and self-contained and easily towed with its gooseneck trailer. This colorizer has low hours of use and is ready to go to work. Also great for custom mixing of sludge/compost/soil.